iBlog: The 13th Philippine Blogging Summit (#iblog13) will be on September 2, 2017 at the Malcolm Theater, UP College of Law, UP Diliman, Quezon City from 8:30 am to 5 pm. 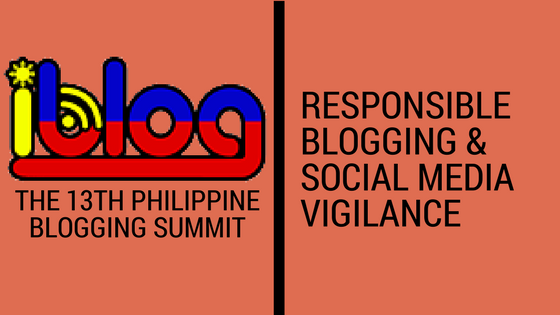 Our theme this year is on “Responsible Blogging & Social Media Vigilance”. We are thankful to UNILAB and Compumatrix for signing up as a gold sponsor for this event. We greatly appreciate it. #iblog13 is a FREE event. It is a popular gathering of newbie, novice, and veteran bloggers, social media users, new media publishers. We tackle topics and themes that are relevant to the online community. How to be a responsible blogger? How to be vigilant on information read through social media? Im interested to attend. Please reserve a seat for me. Thank you. Hi Marie. Just fill-up the registration form and you are in.